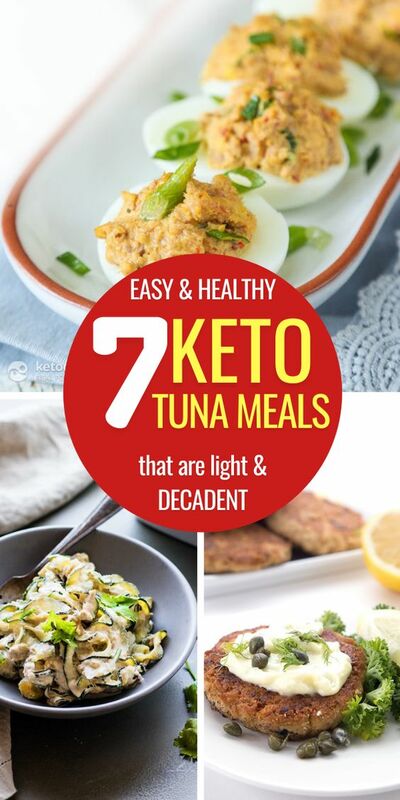 Looking for some easy keto tuna recipes to eat clean? Look no further: these low carb tuna recipes are the best way to eat healthy on the ketogenic diet. 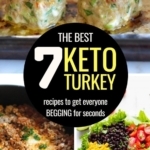 The ketogenic diet is not all about cheese and meat, and this blog post is here to show you how you can make some delicious keto tuna meals the easy way. 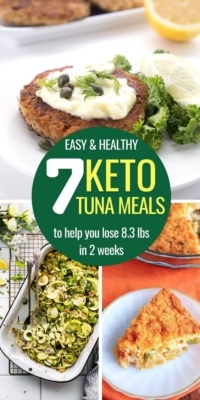 If you’re looking for a way to make some healthy keto lunches or dinners, these low carb tuna recipes are everything you’ll ever need. 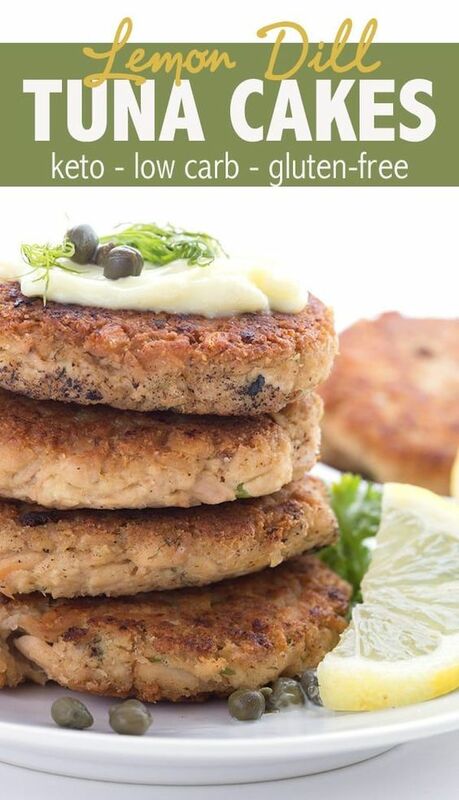 These easy keto tuna patties are not only delicious, they’re also incredibly low-carb. Using simple but tasty ingredients such as green onions, fresh dill, lemon, and mayonnaise, it’s hard to believe you’re actually eating “diet” food. But seriously, at only 1g net carbs per serving, this will probably be one of the healthiest yet most delicious keto lunch/dinner recipes in your repertoire. I like to call the deviled eggs the dream of an appetizer lover! 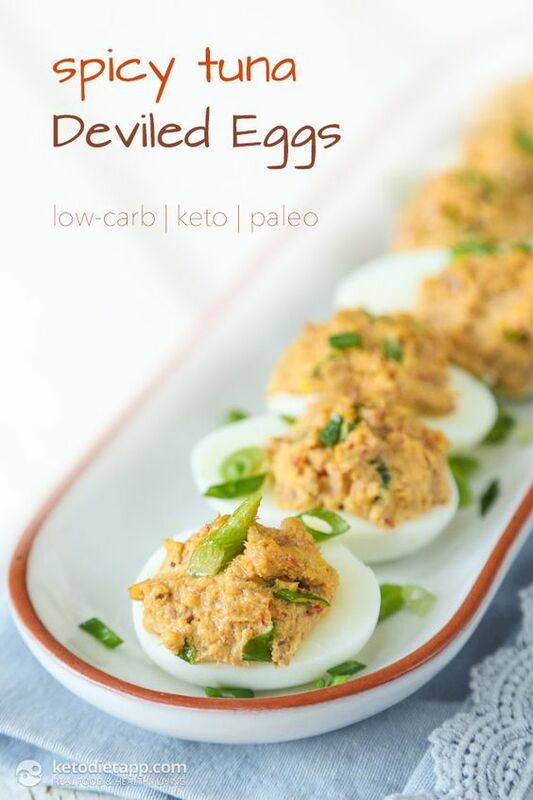 Deviled eggs are a yummy combination of tuna, mayonnaise and sriracha. They’re creamy and work as an everyday low carb appetizer. 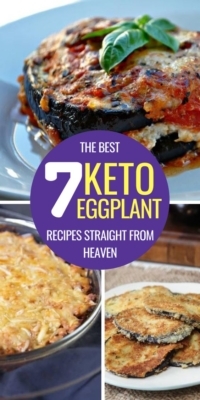 For all the keto fanatics, this is a recipe you need to try at least once! As simple as grabbing all the ingredients and throwing them together, this easy keto tuna salad is still one of the most delicious keto salads ever! If you’re looking for an easy keto lunch or dinner made in 30 seconds or less, this low carb tuna salad will be your best friend. Not to mention there are also avocados in there, which makes the salad even yummier! These delicious low carb tuna melts are the hottest keto snack or appetizer out there! They will melt in your mouth and devour your taste buds and I’m not even kidding! Zucchini takes place of bread and acts like a boat for this marvelous piece of artistic cooking. The best part? There are only 5 easy steps − which are basically just throwing the ingredients together − and 5 basic ingredients. 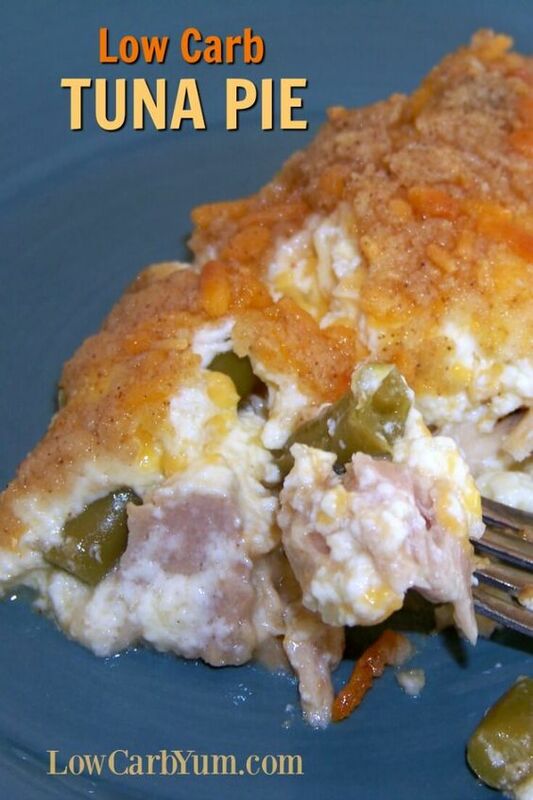 This low carb tuna pie is a dream come true for keto enthusiasts. It’s creamy, cheesy and filled with veggies. It’s a compact, easy to make dish that you’ll definitely enjoy if pies are your thing, and if you also like to eat healthy. Everyone loves eating delicious food, but unfortunately, lunches tend to be the least flavorful meal of the day. Between work and our family, there’s generally not enough time to cook anything special for lunch, and so if you forgot to meal prep the entire week, chances are you’ll be left with either 1) grabbing some fast food or 2) eating some boiled eggs with lettuce. Fortunately, these keto spicy tuna rolls come in handy when you only have 10 minutes to eat but you want something tasty And healthy. No more excuses, the next time you’ve got a busy day, I’m sure you can spare 5 minutes to cook these and enjoy a real, satisfying keto lunch meal. 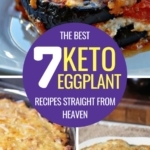 To end this list the right way, what better than a delicious keto tuna casserole with zucchini noodles, avocado, organic mustard, real mayo and coconut milk? I can hear your taste buds scream “Yeees, please!” from here. In short, this is one of a very few healthy keto recipes with veggies that children will love. And you know that’s no small accomplishment! That’s it! 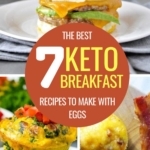 Feel free to Pin It so you can come back later and make these delicious keto tuna recipes! 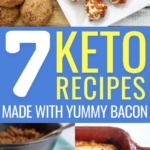 You’ll Love These Keto In Five Cookbooks! As you already know, the key to success is simplicity and satisfaction with your diet. 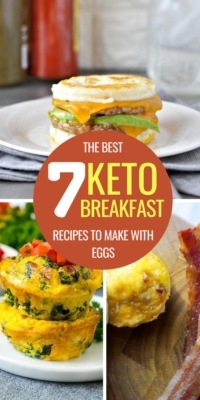 I’ve been on Keto for a long time now, and these are the best e-cookbooks I could ever put my hands on: Breakfast in Five, Lunch in Five, Dinner in Five & Dessert in Five. Each ebook contains 30 recipes. Every recipe is made with just 5 ingredients and has up to 5 grams of net carbs. That means you can have seconds of any meal and you’ll still be within your daily carb limit! If you’re ready to invest a small amount of money to get your precious time and pleasure back, be sure to check it out. I Want To Help You Become Your Best Self! 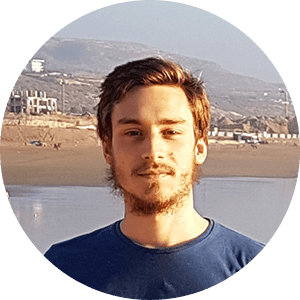 The ketogenic diet has been a true blessing in my life, and I want to share it with you so you can lose weight the easy way.